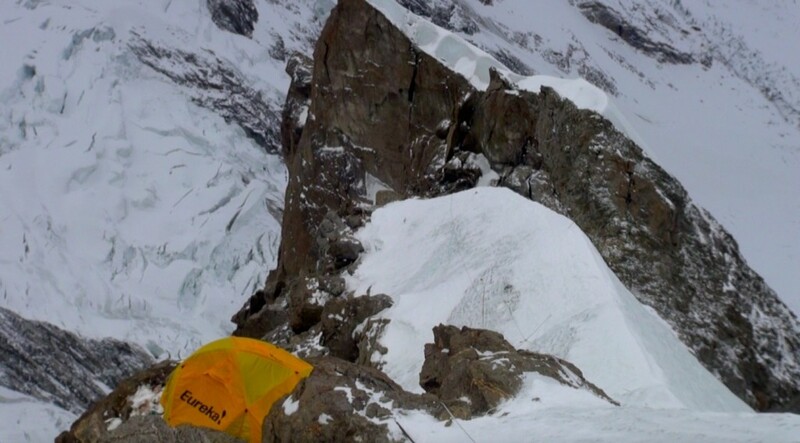 Spanish climber Alex Txikon who was earlier part of K2 winter expedition from north side, permit was denied by China authorities because of terrorist activities. Alex Txikon reached Nanga Parbat base camp 4300m on Jan 25, 2015, along with two Pakistani climbers Muhammad Khan and Muhammad Ali Sadpara. Nanga Parbat is so far unclimbed in winters. Weather is unstable, extreme conditions and terrible winds. Weather is one of the main reasons, Nanga is still unclimbed in winters. 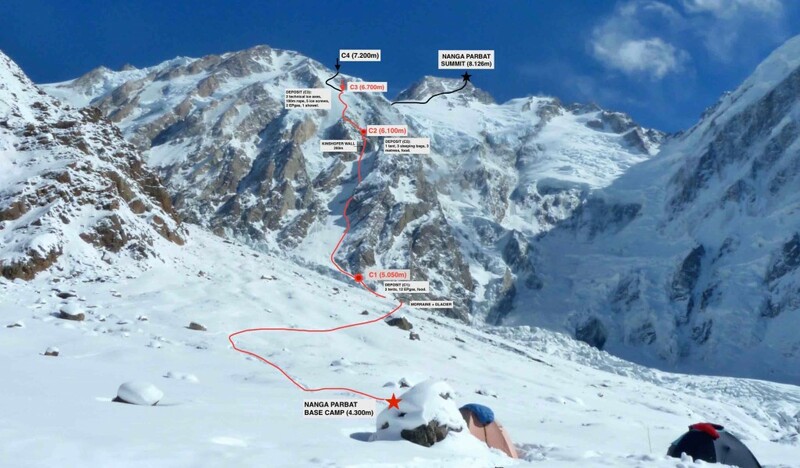 Iranians reached base camp on Jan 28, 2015, on the same date Alex along with two Pakistani climber went on to open route to camp 1, but there was not much progress due to high level of snow. 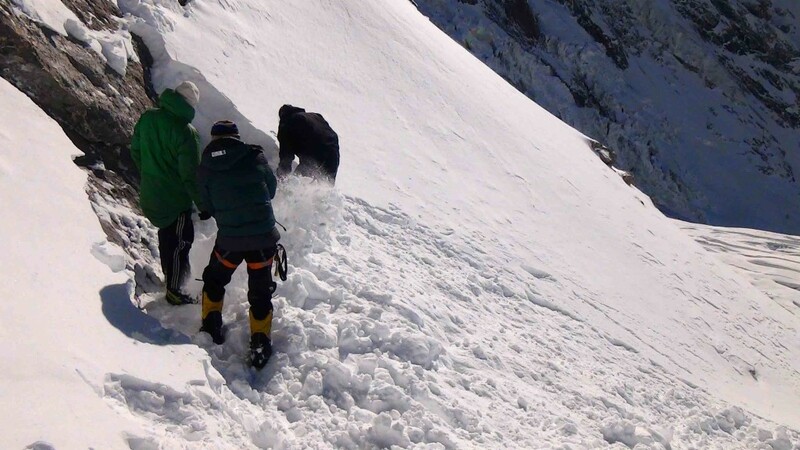 Alex and Iranian opened the route to 4850m on Jan 30, where Iranians helped them. Teams left deposits and 600m rope at 4850. On the next day Jan 31, teams made progress and established camp 1 5050m. Teams returned to base camp 4300m, after leaving deposits at camp 1 5050m. Spanish and Iranian team left base camp again on Feb 04, 2015. They went straight up to 5,450 meters, left 400m rope on the field. They returned to camp 1 5050m for sleep, after leaving deposits at 5450m. Teams started from camp 1 on Feb 05, teams were able to reach camp 5800m and returned to camp 1 for sleep. 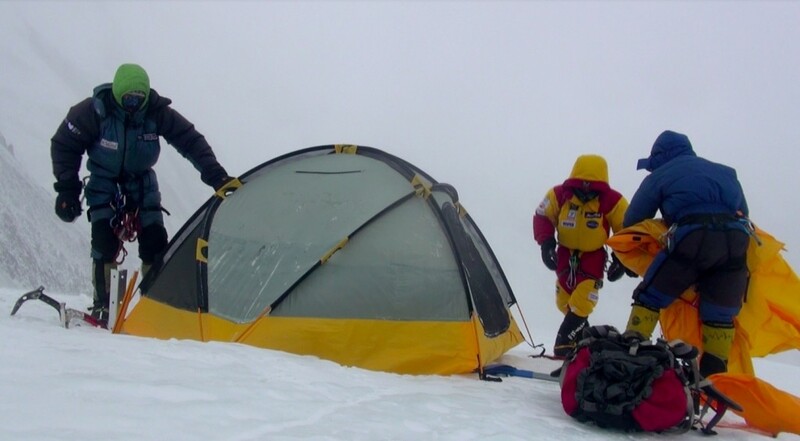 Spanish and Iranians started from camp 1 5050m on Feb 06, and were able to reach 5900m, just below Kinshofer line. Deposits of 1300m rope and food were left at 5900m. This was end of rotation one, teams could not cross Kinshofer line. Italian climber Daniel Nardi, who climbed up to 6100m on Mummery rib. Daniele’s camp3 was hit by an avalanche after just 15 minutes he left the camp. Daniele was invited by Alex to joined them on Kinshofer route, since risk was become incalculable on mummery rib due to continuous avalanche falls. Daniele joined Alex on Kinshofer line. It was Alex, Daniele and Muhammad Ali Sadpara who left base camp on Feb 09 and reached camp 1 5050m and spent night there. Iranians along with Muhammad Khan choose to wait another day in base camp. They planned to climb to camp 2 straight from base camp the very next day. Feb 10, They started from camp 1 and established camp 2 at 6100m after a very tough day. This was the day, they continuously negotiated 250m Kinshofer line. Iranians started from base camp, but reaching straight to camp 2 was a very tough ask, they were half way to camp 2 when they decided to descend to base camp, since it was too late for them. Feb 11, Teams started from camp2 6100m and fixed another 500 meter of rope up to 6500m, and returned to camp 2. This was the second night at camp 2 6100m. Feb 12, Teams started from camp 2 6100m and established camp 3 at 6700m. Teams spent the night there and next day they returned to base camp. This is end of 2nd rotation.